Heroic Quests add new depths to Mage Knight Dungeons, allowing you to explore new settings using the Mage Knight Dungeons rules. 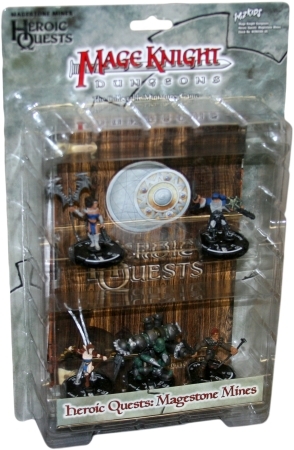 This set include a complete Heroic Team, the Sun-Hunters. The double-sided map of the mines is designed to work with the scenarios included. In addition to the four Heroes, the set includes Corpheus, an ultra-powerful Mage Spawn, eight wandering monster tokens, and the Adventure book. The book contains four scenarios for the mines, fiction, bios, and play tips for the Heroes. Heroic Quests add new depths to Mage Knight Dungeons, allowing you to explore new settings using the Mage Knight Dungeons rules. 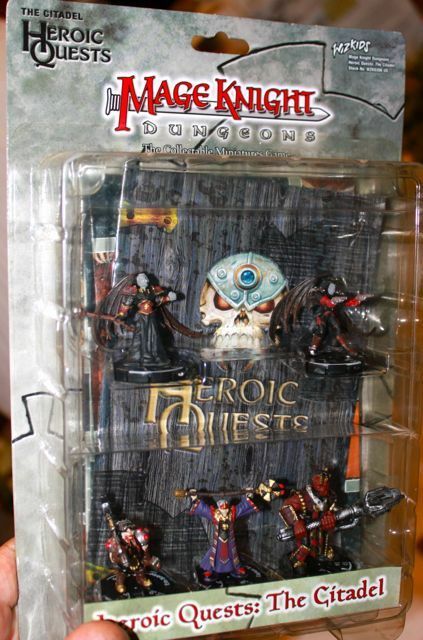 This set include a complete Heroic Team, the Black Blades. The double-sided map of The Citadel is designed to work with the scenarios included. In addition to the four Heroes, the set includes Captain Salidar, an ultra-powerful Mage Spawn, eight wandering monster tokens, and the Adventure book. The book contains four scenarios for The Citadel, fiction, bios, and play tips for the Heroes.